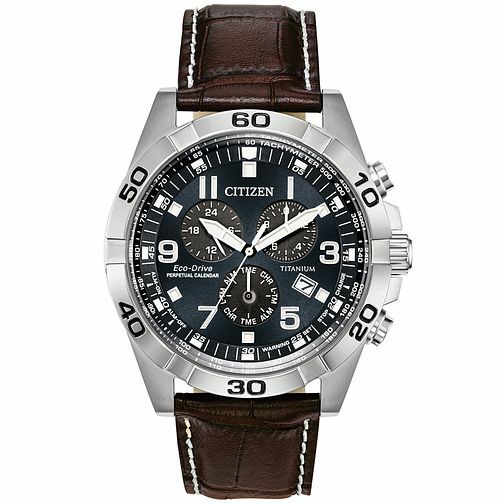 Take things up a notch with this Perpetual Calendar Chronograph from Citizen. Includes a 1/20 second chronograph measuring up to 60 minutes, 12/24 hour time, dual time, date and alarm. Featuring a stainless steel case, classic brown leather strap and handsome blue dial. Proudly boasting Citizen's award-winning Eco-Drive technology, harnessing both natural and artificial light and converting it into energy to power the watch, a watch that never needs a battery.